Tillers have a number of product features and moving parts that's why performing regular tiller maintenance checks is crucial to its performance. 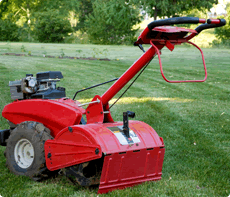 If you find yourself in need of help when performing Tiller maintenance or repairs be sure to call the lawn equipment repair experts at ReadyRepair. Some quick tips: gas powered engines are especially vulnerable if not started for during the winter months. Tires, tines, and cables need attention after repeated usage from the previous season. Call us today for more information about how we can be of assistance in performing regular maintenance on your lawn and garden tiller.